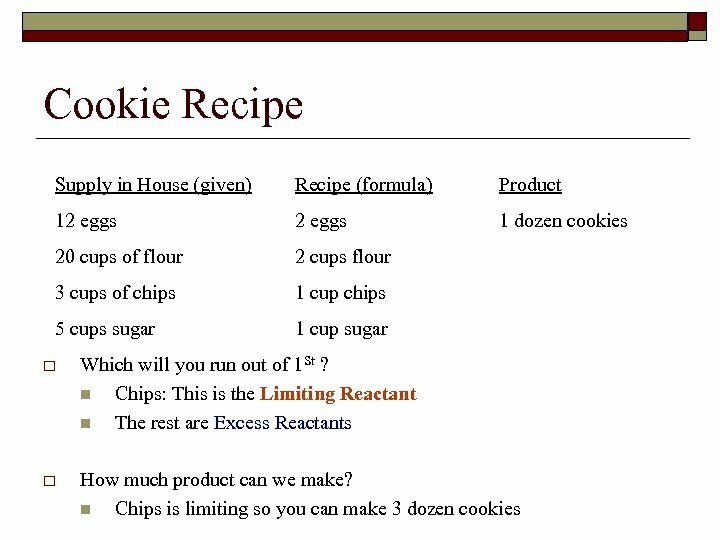 How much Product? 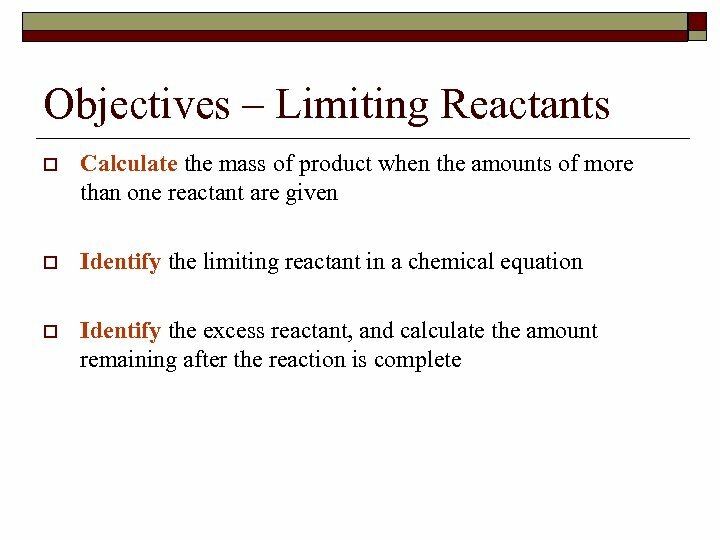 o Laboratory reactions do not always produce the calculated amounts of products n Reactants stick to containers n Spills n Competing reactions form other by products o Theoretical yield is the maximum amount of product that can be produced from a given amount of reactant n This is what we figure out with math! 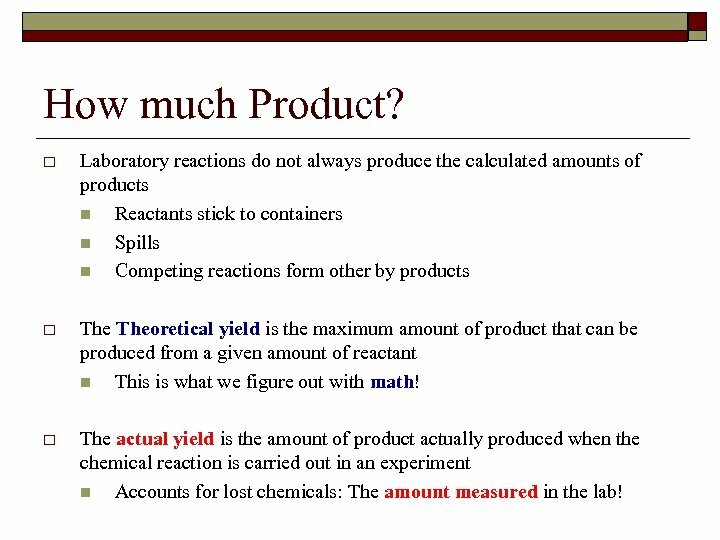 o The actual yield is the amount of product actually produced when the chemical reaction is carried out in an experiment n Accounts for lost chemicals: The amount measured in the lab! 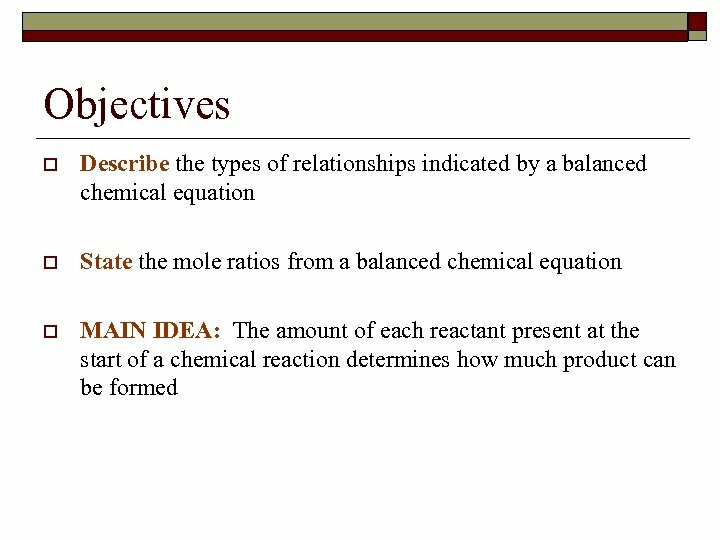 Key Concepts • Balanced chemical equations can be interpreted in terms of moles, mass, and representative particles (atoms, molecules, formula units). 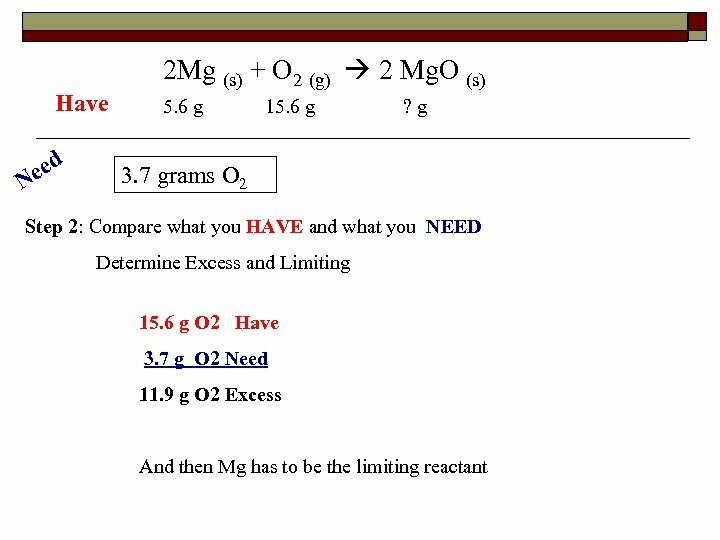 • The law of conservation of mass applies to all chemical reactions. 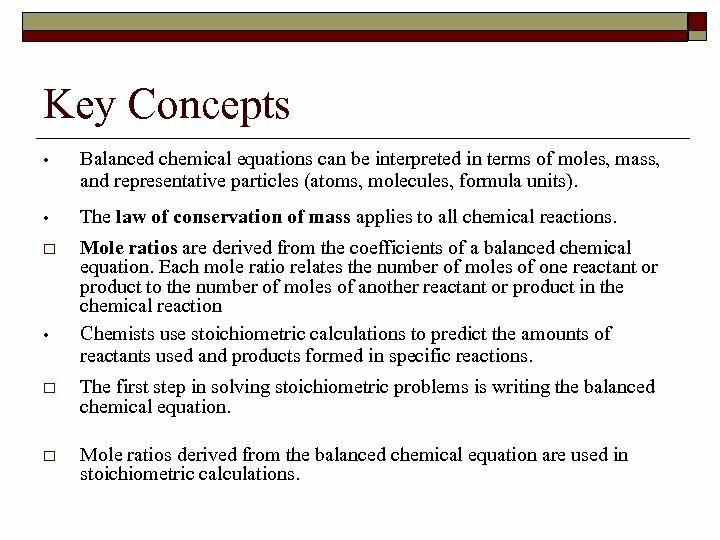 o Mole ratios are derived from the coefficients of a balanced chemical equation. 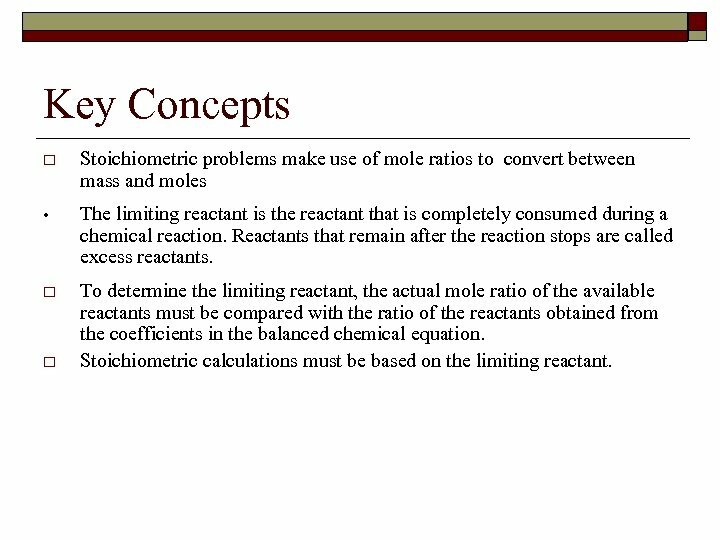 Each mole ratio relates the number of moles of one reactant or product to the number of moles of another reactant or product in the chemical reaction Chemists use stoichiometric calculations to predict the amounts of reactants used and products formed in specific reactions. 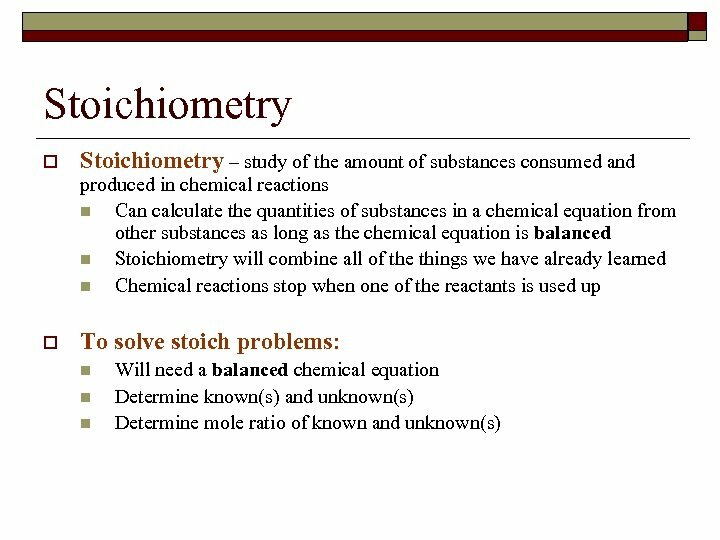 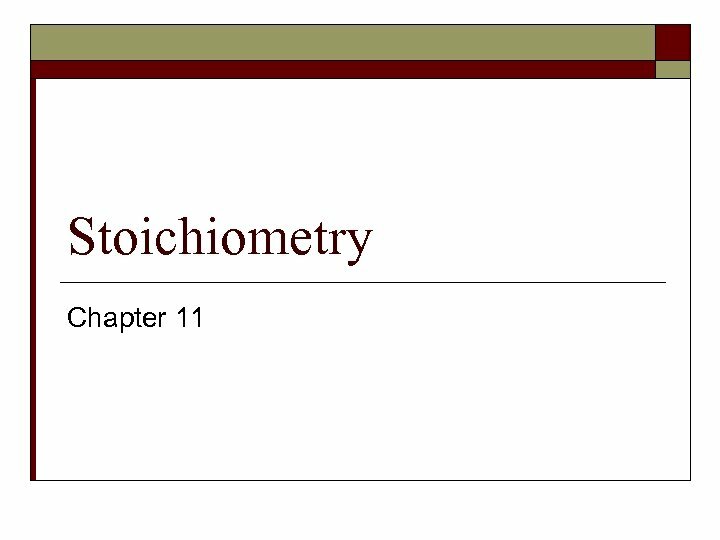 • o The first step in solving stoichiometric problems is writing the balanced chemical equation. 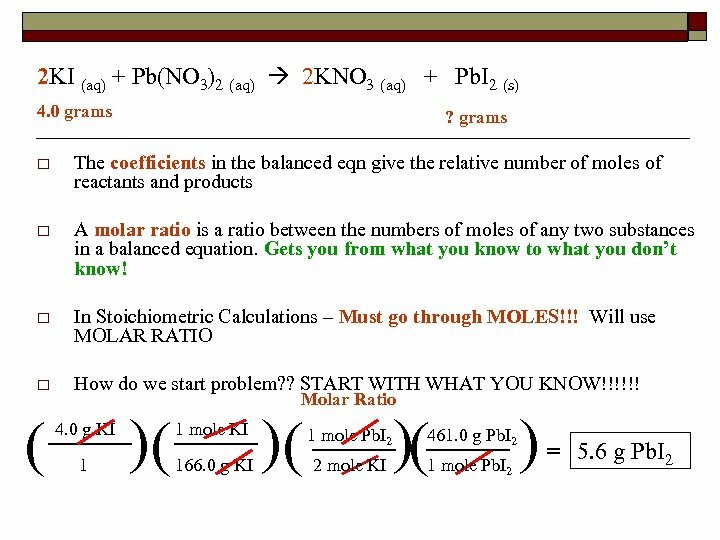 o Mole ratios derived from the balanced chemical equation are used in stoichiometric calculations. 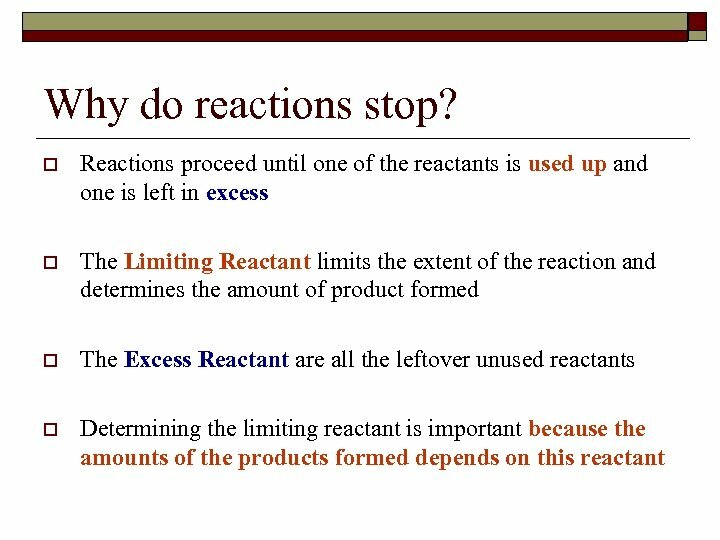 Key Concepts • The theoretical yield of a chemical reaction is the maximum amount of product that can be produced from a given amount of reactant. 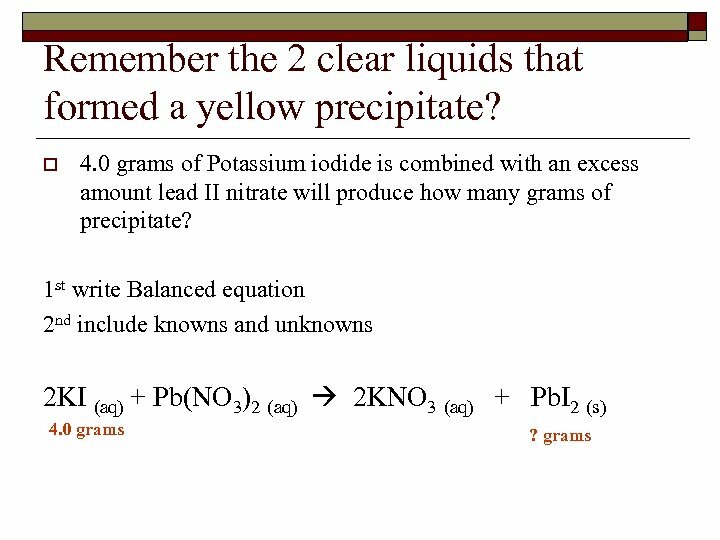 Theoretical yield is calculated from the balanced chemical equation. 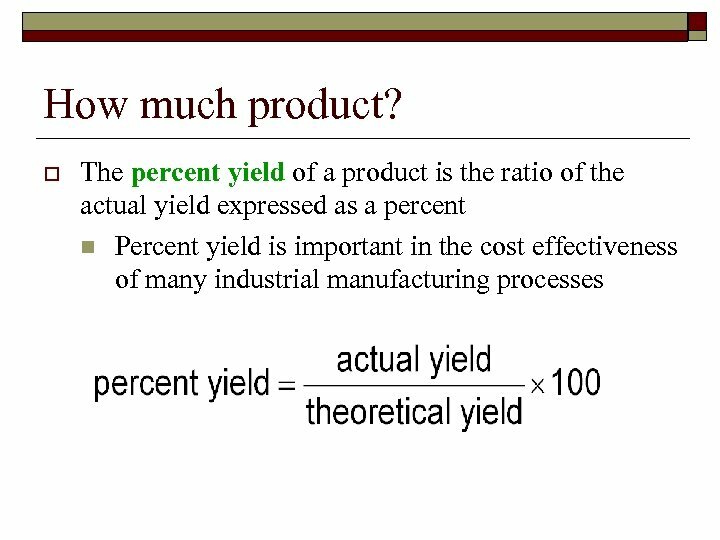 o The actual yield is the amount of product produced. 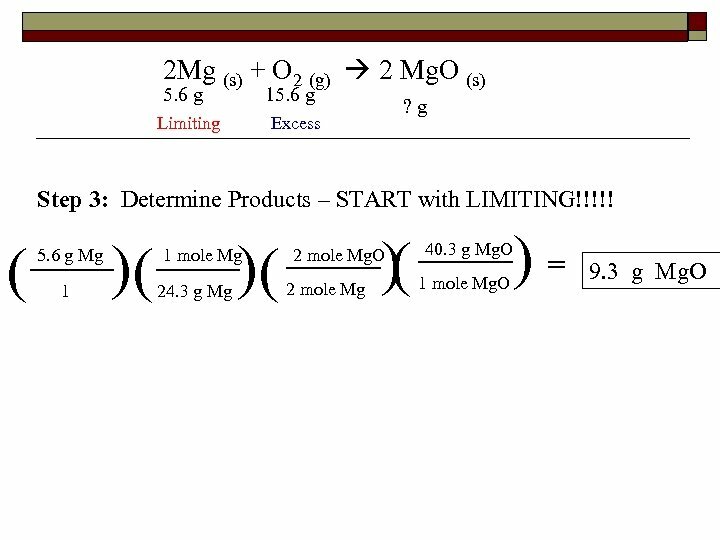 Actual yield must be obtained through experimentation. 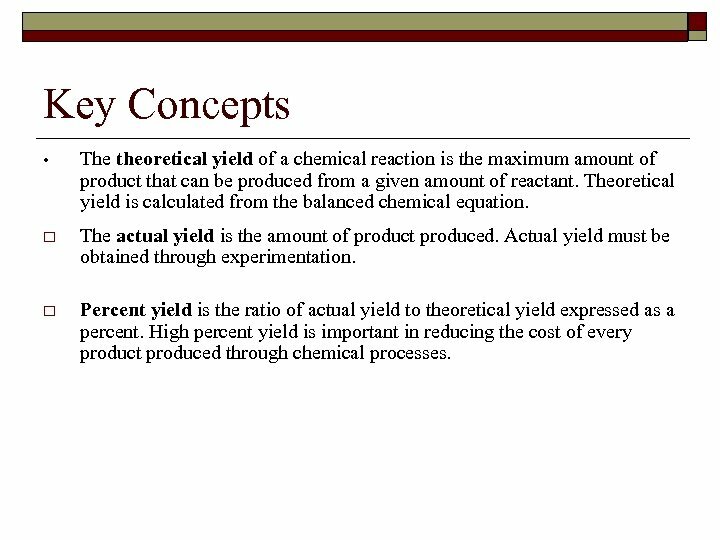 o Percent yield is the ratio of actual yield to theoretical yield expressed as a percent. 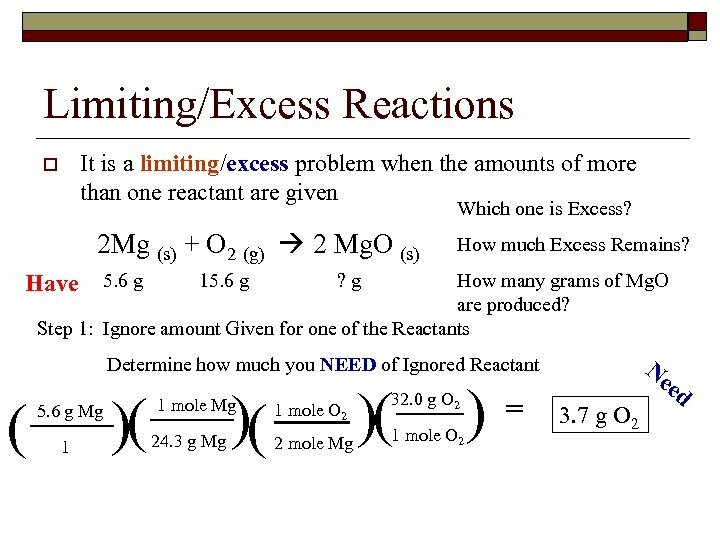 High percent yield is important in reducing the cost of every product produced through chemical processes.